I just wanted to share a bit about one of my favorite wild edibles in the Bay Area: the 3 cornered leek. 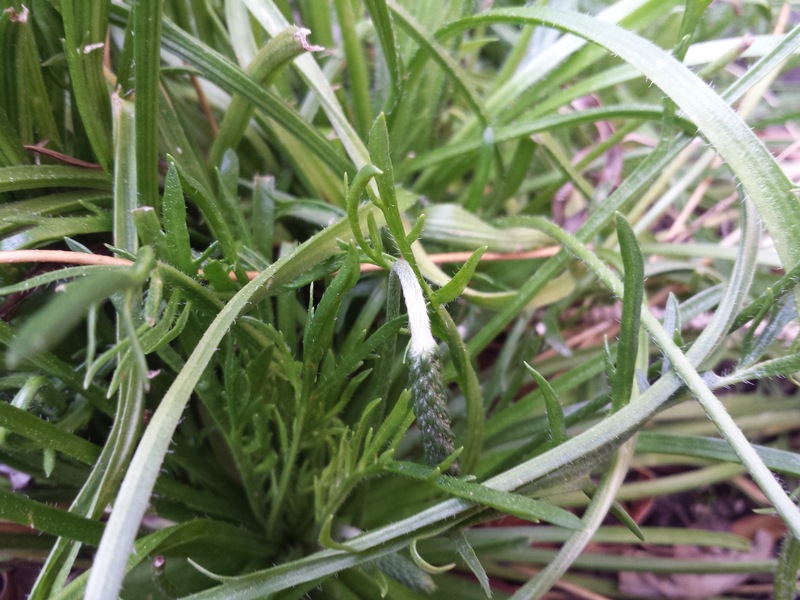 For years I called it the “wild onion lily”, and it was mentioned in my book, The Bay Area Forager, as such. I cannot remember where I first heard the new name, but 3 cornered leek is way sexier to chefs and eaters alike. This name sounds more like a gourmet edible than a bush food and it deserves high consideration as a culinary delight. 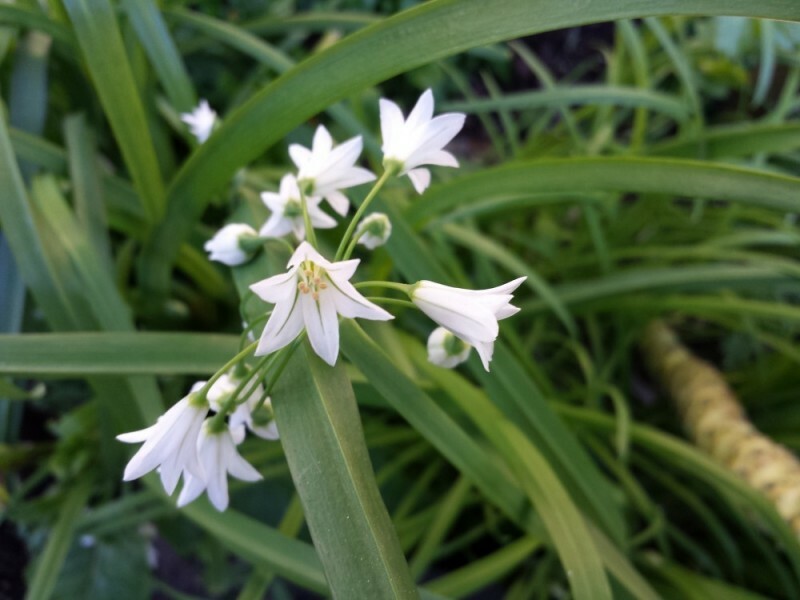 Closely related to garlic and onions, the 3 cornered leek (Allium triquetrum) is from the Mediterranean region of the world, and was introduced to California by European settlers. It now grows wild all over the Bay Area, typically in human disturbed landscapes — lawns, gardens, and in urban and suburban landscaping. 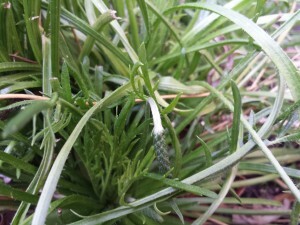 Most consider it a weed! Despite the fact that it is delicious and attractive. I use the very mild greens like chives or green onions (but I like them more!) and the beautiful white flowers I add to salads and on top of soups. 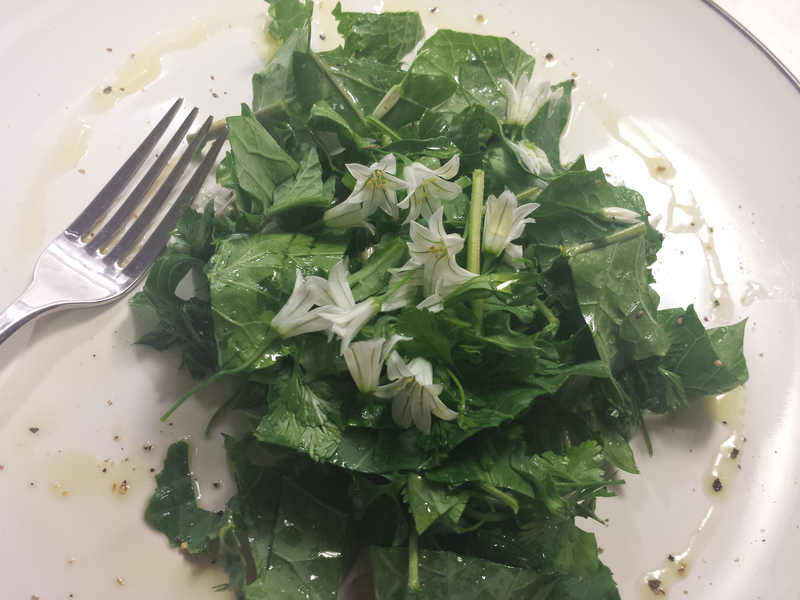 The flowers are much stronger in flavor than the greens. 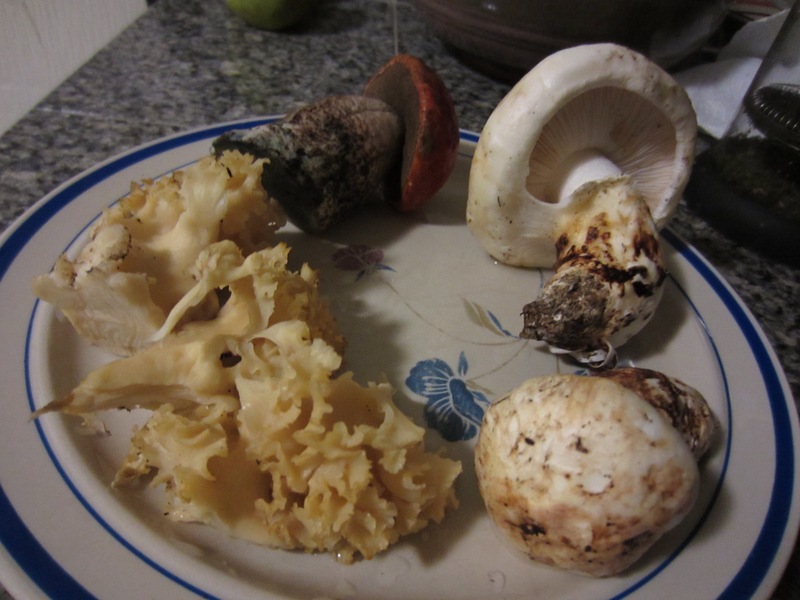 The bulbs are also delicious, especially cooked, where they can become almost creamy. They take several years to get golf ball sized as best, so I typically reserve the bulbs for special occasions or when I have access to a giant overgrown patch. Their season is basically our rainy season, October until May. They die off in the summer and disappear from the landscape until fall, when new green growth emerges from their dormant bulbs. Flowers are typically available in April. Be sure to enjoy some this season! 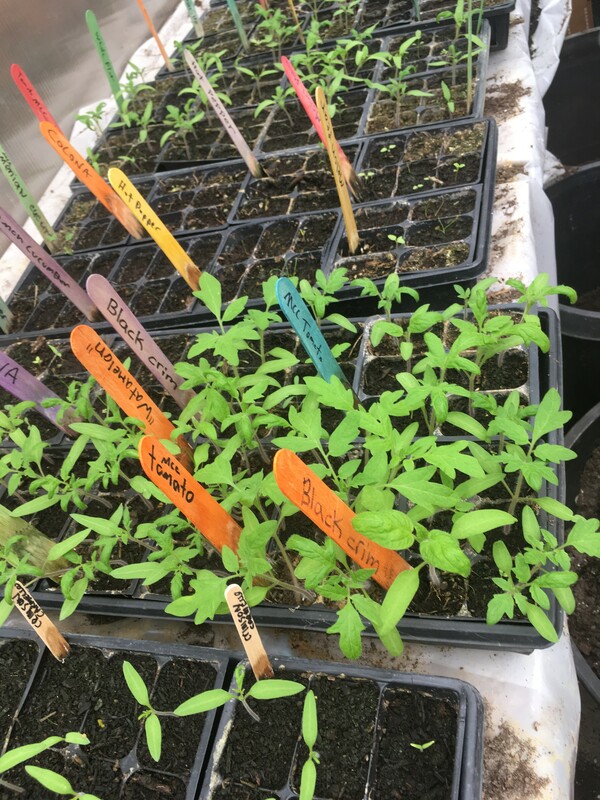 Matthew Falco wants to heal the planet by growing his garden. Real estate being at a premium, he purchases land far out in the rugged and beautiful wilderness. 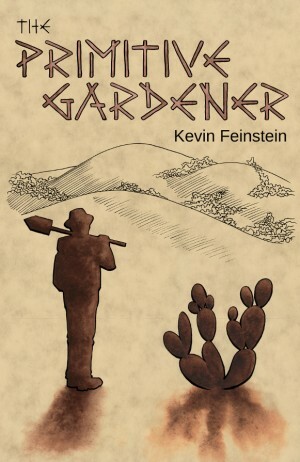 He sets out with the intention of thriving on the land, but the struggles he encounters test his very will to survive. The tale follows Falco as he rehabilitates the land, forages for wild plants and mushrooms, hunts wild game, and faces his biggest challenge — the loneliness of his own mind. Enter the wild, full of beauty and danger, where Falco strives to find his role in the world of society and his place in nature. Wild Edible Plant Foray and Tour and Mega Diverse Garden Tour — August 12, 2017 Saturday 10am-12pm (Lafayette) $40 –Join Kevin Feinstein (Feral Kevin) on a guided tour of local edible wild plants in the hills East of the Caldecott tunnel. 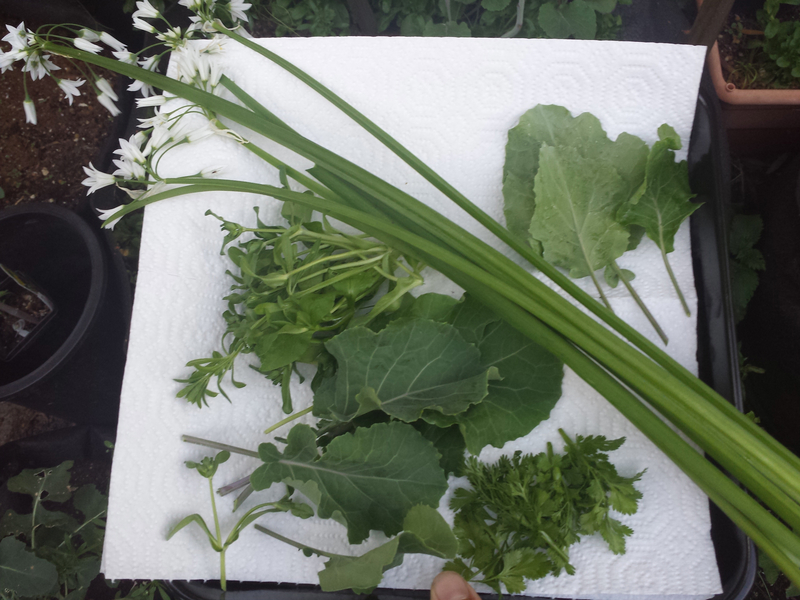 Sample the promise of what the season brings to our area in terms of foraging. In this class, we are able to actually forage for many things! So not only bring your learning hat, but your bags and clippers, too! Also visit the mega diverse garden, full of unusual and exciting fruits, greens, and herbs! Directions will be emailed to you, please follow them! Notice in the picture how the one tray of tomato seedlings looks way further along and happier than the rest. The only difference was that the plants that are grew much faster were from seeds that were saved on site by me. The rest were purchased (but very high quality.) Same soil mix, same type containers, same watering, equal lighting — the exact same conditions. Other than consciousness affects, the source of the seeds is the only theory I have as to how there could be such a marked difference in the growth. I would assume because they are already that much more adapted to our local conditions. Yay seed saving! Not only did we have our first sunny day in a long time here this weekend, it was warmish (61 or so) and beautiful. Now being in mid February, we are far enough away from the Winter Solstice that the sun can actually begin doing something. I made a green smoothie from the backyard patio garden for the first time in a while. It’s been a great mushroom year, and they are still popping up! This Sunday, January 22, 2017, I will be leading a mushroom class in Petaluma at Tara Firma farms. Candy caps, for one, have been spotted! I will offer private mushroom classes going forward, but this is probably the last open mushroom class of this season. I won’t probably schedule another until late November 2017. The rains have begun, and if other forces come together, there will be mushroom foraging! I’ve added two classes for now, hopefully there will be more possible and remember our mushroom season is super short, so don’t miss it! I am also available for private mushroom tours, just email me! feralkevin (at) gmail (dot) com. Crash Course in Wild Mushroom Foraging and Tour November 27, 2016, Sunday 10am-12pm. (Lafayette or Oakland Hills TBA). This is the class you need if you are a beginning mushroom forager. I recommend taking this class BEFORE you start trying to use field guides to identify mushrooms and BEFORE you go on a big mushroom expedition. This is the class I wish I had when I started learning about mushrooms years ago. Crash Course in Wild Mushroom Foraging and Tour December 10, 2016, Saturday 10am-12pm. (Lafayette or Oakland Hills TBA). This is the class you need if you are a beginning mushroom forager. I recommend taking this class BEFORE you start trying to use field guides to identify mushrooms and BEFORE you go on a big mushroom expedition. This is the class I wish I had when I started learning about mushrooms years ago. We were out on a bike ride and noticed a beautiful fully grown loquat tree at the end of a court along the trail. Many of its fruit were ripe, reachable and good, so we grabbed a few to take home for later. 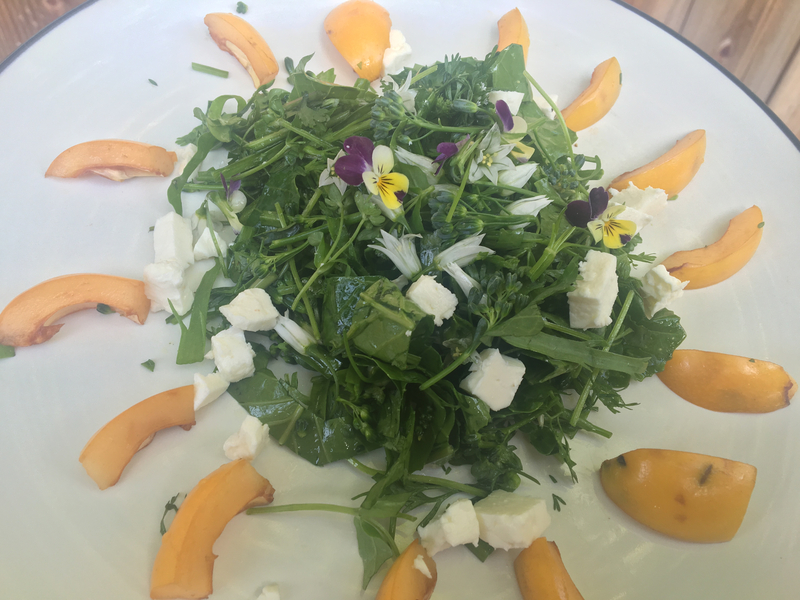 We chopped them up and added to them: the slices of loquat, feta cheese, camelina oil / olive oil blend, black pepper and the finest salt in all the Shire. Also while out on the trail, we came across a very interesting super early feral mulberry tree. 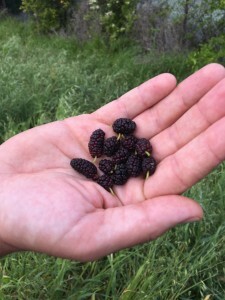 We gathered a handful of the ripe berries, which were very good, not the sweetest but had more of that unique mulberry taste with an amazing texture. We added them to Strauss vanilla ice cream drizzled with sunflower butter. I might make another post about this mulberry tree soon. comments: The baby collards hit the umami receptors, but all the food had that richness. The subtle mustardy spice kick of the collards and the garlic/onion spice of the wild onion lily flowers was balanced by the cool succulent quality of the mache. The cilantro tips add almost a sweetness that just made it all work. It really brought out the taste of the garden. We liked this one a lot. Did nothing else while eating it. Everything in both dishes organic and beyond. All greens and herbs from 8 feet outside the kitchen grown in soil high in trace minerals and beneficial microbes using filtered water.